Anne was born in a little town in central Spain called Almendral in 1549. She had three brothers and three sisters. When she was ten, she lost both her parents in a plague that spread across Spain. She had an extraordinary spiritual life from an early age and her visions and revelations continued throughout her life. As a teenager she had a vision where the Virgin told her she would become a nun. She worked as a shepherdess, and when her family tried to arrange a marriage, she declined and despite their opposition, Anne entered the first of St. Teresa’s new monasteries – St. Joseph’s in Avila – in 1570, at the age of 21. She was a lay-sister, and was very hard working. She often had no time for prayer during the day, so she devoted time to prayer during the night. She did not know how to write until she entered Carmel where she learned from St Teresa herself. In 1577, Teresa chose Anne as her personal assistant, nurse and secretary and during the next 5 years Anne was her inseparable companion, travelling with her and assisting in the last four foundations. All of Teresa’s letters in the last few years of her life were dictated to Anne. Teresa died in Anne’s arms in 1582 at the monastery in Alba de Tormes. 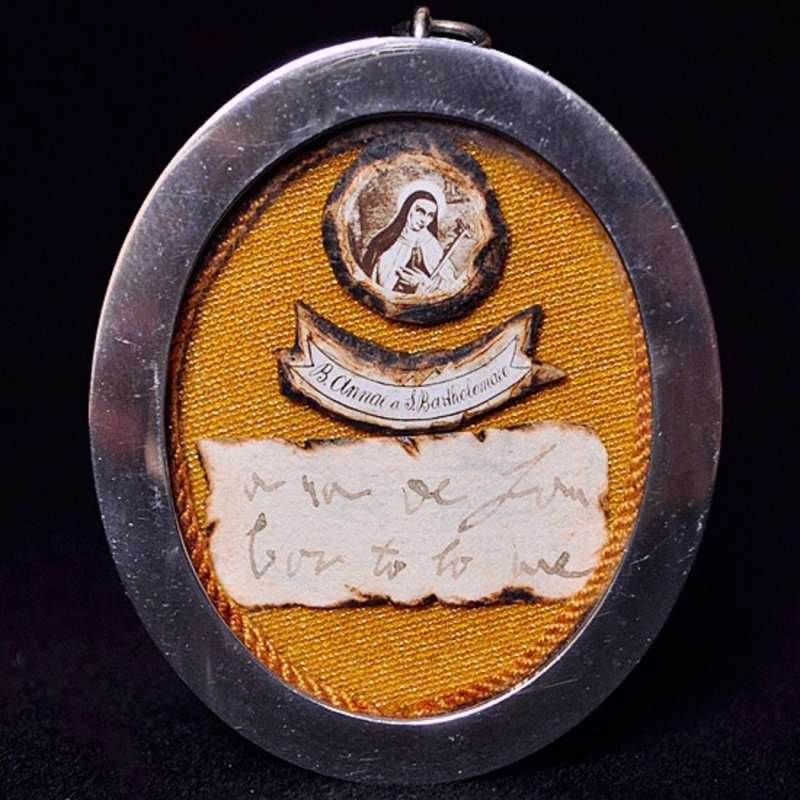 The relic featured here is a beautiful silvered reliquary (2″ by 2 1/2″) containing an extremely rare signature relic of Blessed Anne of St. Bartholomew. 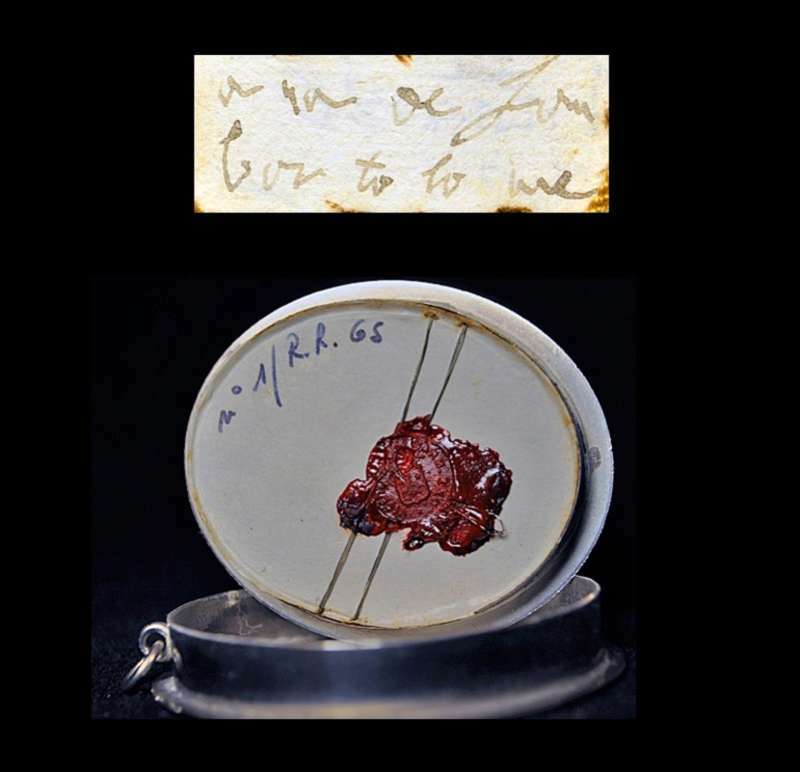 The wax seal and threads are unbroken and all in place. The relic is from the private collection of a Flemish priest who passed away recently. He traveled worldwide to monasteries and holy places to collect relics directly. Blessed Anne of Saint Bartholomew’s memorial is celebrated on June 7th. She worked as a shepherdess in her youth and became a lay Carmelite at age 20 under the direction of Saint Teresa of Avila. Anne became secretary to and close friend of Saint Teresa; Teresa died in Anne’s arms. Upon the death of Teresa, Anne continued to work on the Carmelite reform in France. She became the prioress of houses at Tours and Pontoise and founded the Carmelite house in Antwerp, Belgium in 1612. Anne wrote poetry, some of which has survived to today. Anne was born October 1, 1549 and died on June 7, 1626, of natural causes. The relic of Blessed Anne is a very beautiful addition to the Papal Artifacts Collection of relics. 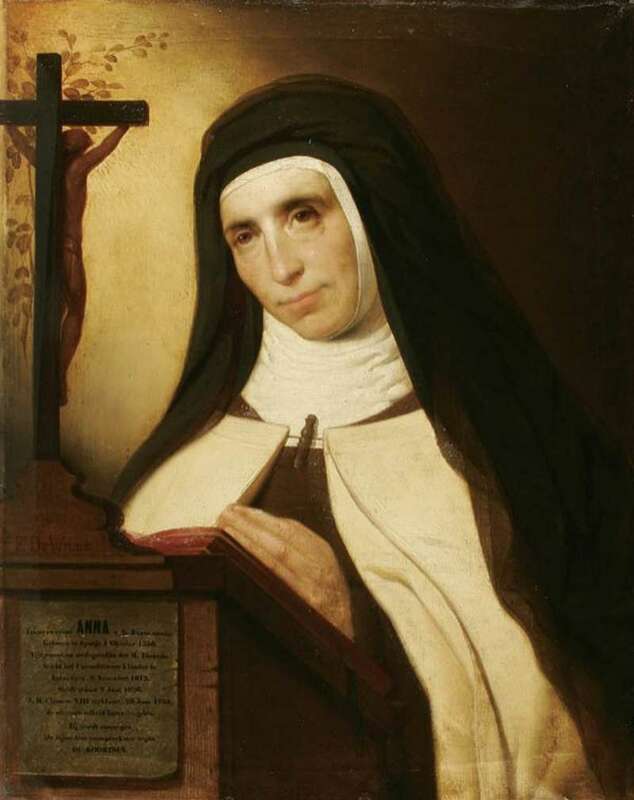 In 1604, Anne was among the group of nuns chosen to accompany Ana de Jesus on the expedition to France, where she was forced to take the black veil as a choir nun against her will. She assisted in the foundation of several French convents and served as prioress at Pontoise, Paris and Tours. She suffered very much during this time because of the excessive control of French male superiors. After her time in France, she then went on to the Netherlands where she founded the convent at Antwerp in 1612. She remained there until her death on June 7th in 1626. Soon after her death, miracles were attributed to her intercession and it is claimed that by 1632 over 150 miracles had been approved. She proved herself, like St. Teresa, a daughter of the Church in her great zeal for souls. n 1735 Pope Clement XII declared the heroicity of her virtues and she was beatified by Pope Benedict XV in 1917. Her writings include a number of letters still preserved, an autobiography and several treatises on spiritual matters. Saint Teresa of Ávila turned her poems into melodies to help bring as many people as possible closer to God. She used music that was popular during her time, changed the words, and inserted her own verses. Five hundred years later, the mezzo-soprano and researcher Sonnia Rivas has reversed the process. She found that almost forgotten music and has used the poems of Saint Teresa of Ávila, John of the Cross and Anne of Saint Bartholomew to turn them into songs. The result is this. That first song also became the title of the first album, which was released in 2003. The project was a resounding success. It was even nominated for a Grammy for classical music. However, another honor was hard to forget. Melodies, texts and instruments from the sixteenth century. Another one of the stars from the recital is the vielle, an instrument from the same family as the guitar, which was popular in Spain at the time. Mystical music, along with walls of stone at a Spanish church in Rome, make the teachings of the saint resonate stronger than ever.